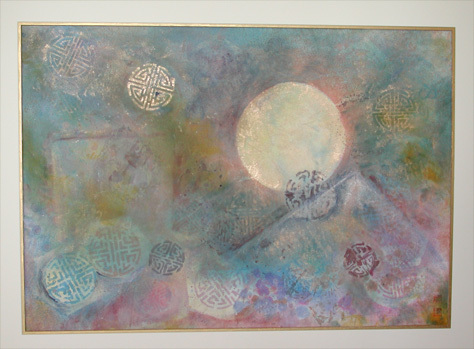 Size (sight) 24"x33" Framed 35"x45"
The painting is on handmade Shuen Paper and has been collaged with handmade painted papers. The dual shapes are "STUPAS". The Chinese feel that "STUPAS" represent the five elements: wood, fire, water, metal, earth. 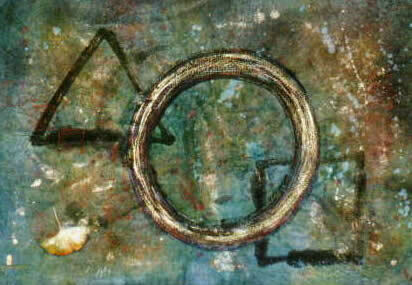 A circle symbolizes wholeness and the trigrams on either side of the middle panel stand for male and female. The Artist uses hand ground Chinese ink and watercolors to achieve the desired results. The red seal is the name of the Artist (Bettie Sarantos). The seal was carved by Hong Kong Artist Tang Siu Hung. 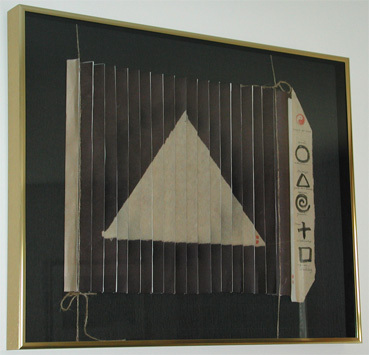 "Triangle, Circle, Square with Ginko"
Size (sight) 23"x33" Framed 32"x42"
The Artist likes to use the Universal symbols of the circle, triangle and square in many of her images. Square represents stability, solidity and security. Triangle denotes goals, dreams and vision. 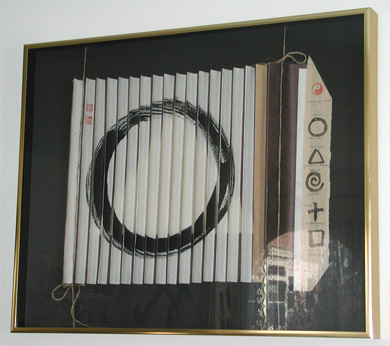 The painting is on handmade Chinese paper with some collage. Sarantos used hand ground Chinese ink and watercolors. An antique seal was stamped in the background. 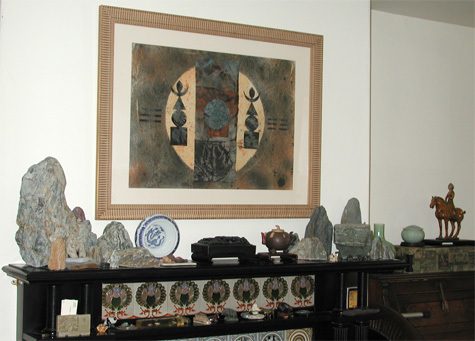 The double seal is the Artist's name and was carved by Hong Kong Artist Tang Siu Hung. 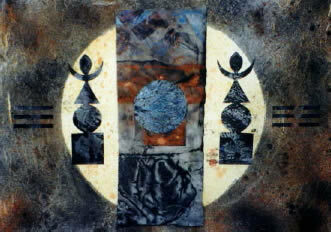 The painting was in the Newport Art Museum Annual Members juried Show in 1997.